Sightseeing in Ashgabat, visiting the parks and squares of the capital, Ertogrul Ghazi mosque, the archeological site “Nisa” (The ruins have mud brick remains of fortifications and palaces, temples, ceremony hall, treasury building. It covers the remains of Parthian civilization, what combined the traditional art and culture with Hellenistic and Roman elements. The richly decorated architecture of religious, royal power and ordinary domestic functions had been revealed as the result of archeological excavations, started from beginning of 20th century and are continued in our days. Nisa or Parthaunisa presumed to be the first capital of Parthians, its ancient people lived along Kopet Dag mountain range (modern Turkmenistan and Iran). Accordingly to UNESCO description, Nisa played important role of a barrier to Roman Empire expansion to the west, while playing the communication and trading centre between east and west, between central Asia and Mediterranean cultures. Discover Turkmenbashy spiritual mosque in Kipchak. Return in Ashgabat. O/N at hotel. Visit Novruz festivity village, 15 km to west from Ashgabat and participate in Turkmen Novruz events. *This day is official opening and time to visiting it can depend on official schedule of the event. Given that Turkmen government will be visiting the event there will be certain regulations for transport to enter in the area. Pls consider the possibility that we leave our transport on the road and walk to site on foot. 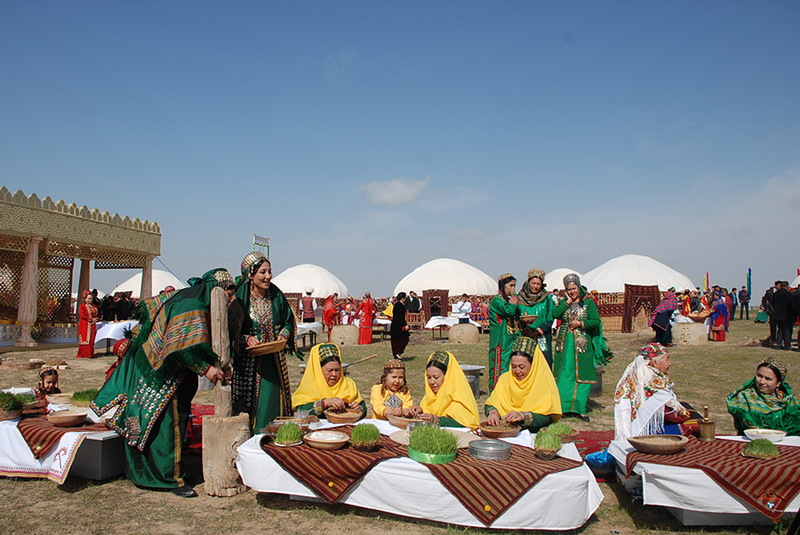 Visit the Novruz village, you will experience Turkmen culture through contact with local people. 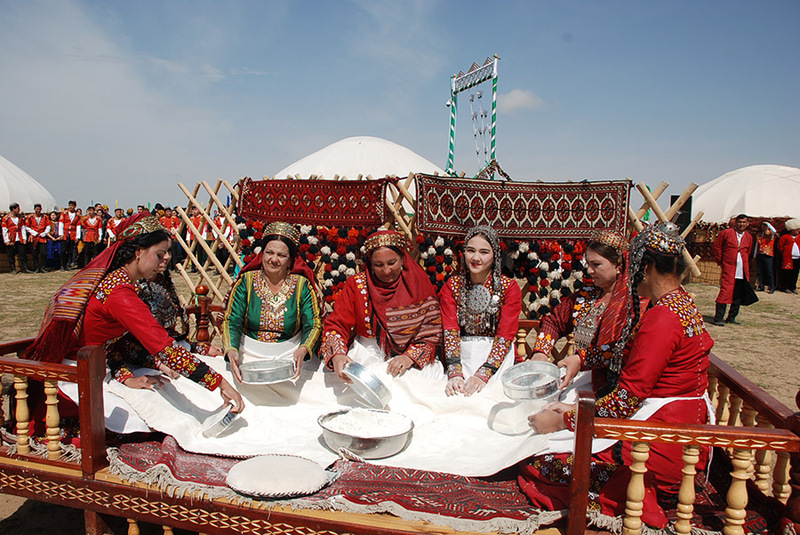 Visit a yurt, see its interior, see how Turkmen bread in tamdyr (oven) is cooked. We discover national dish recipes, local styles of preparing, cooking and serving national dishes. 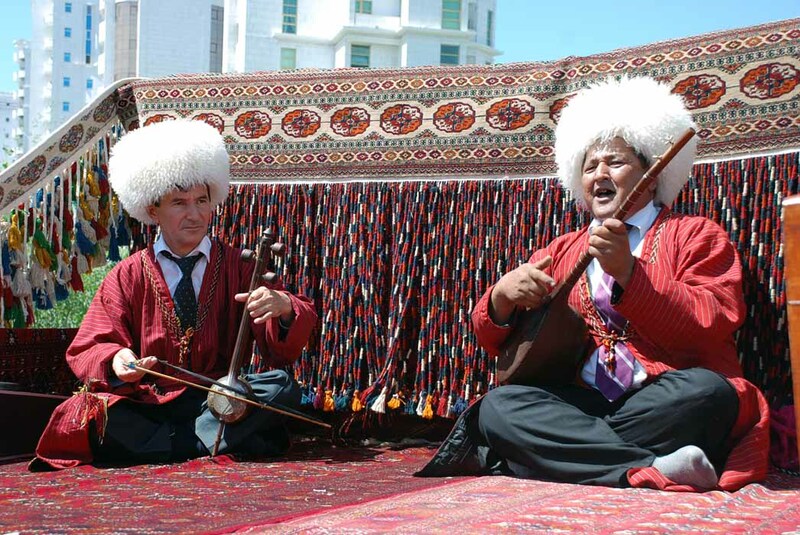 Visitors see the girls making embroidery, alaja (two coloured twined ropes), dancing and listen singing of Turkmen bagshy (singer) dressed in national Turkmen costume with traditional music instruments such as dutar and gyjak. See Turkmen carpets, felts making, jewelry. Drive to Kopetdag mountains. Discover on the way Kov Ata cave lake & Ahal Teke private horse farm (Experts say the Akhal-Teke breed is at least 3,000 years old, may be the last remaining strain of the Turkoman (a horse that has existed since 2400 B.C.). In the Middle Ages (500 to 1500 A.D.), Akhal-Tekes lived with nomadic tribesmen near the Kopet Dag Mountains in Turkmenistan. The nomads treated the horses as part of their families, tethering them near their shelters. In the early 1900s, Russians used Akhal-Tekes as cavalry horses. Today they excel in sport, particularly in racing, show jumping, dressage and endurance racing. The Akhal-Teke breed has preserved type, purity and performance abilities of its ancestors into modern times thanks to the geographically isolated area of the harsh Kara Kum desert where the horses have been bred by the Akhal-Teke tribe since ancient times. The Akhal-Tekes are still being bred for speed and stamina by the Turkmen and one of the most famous stallions of modern times, Yanardag, is a part of the national emblem). 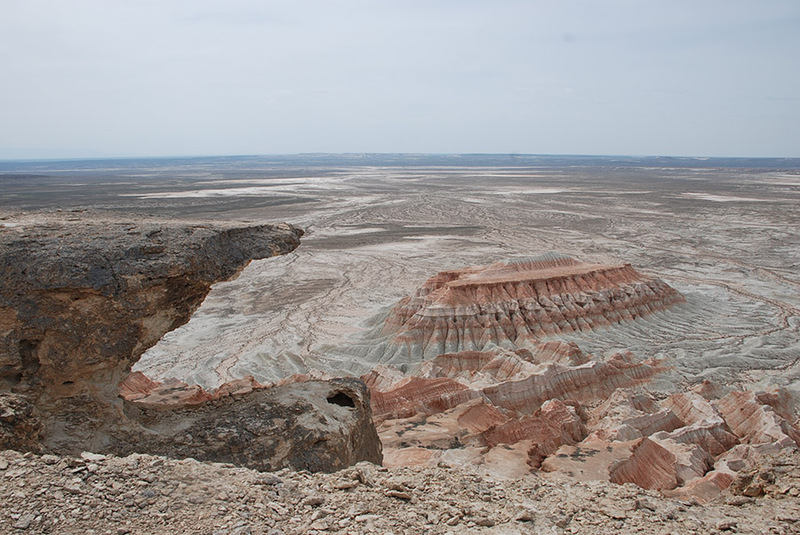 Drive to Yangy Kala (The south eastern bordering area of Gara Bogaz Gol bay, it has spectacular view of the former sea bed, and millions of years work by natural forces to form the canyons in its unusual shapes and variety of colors). 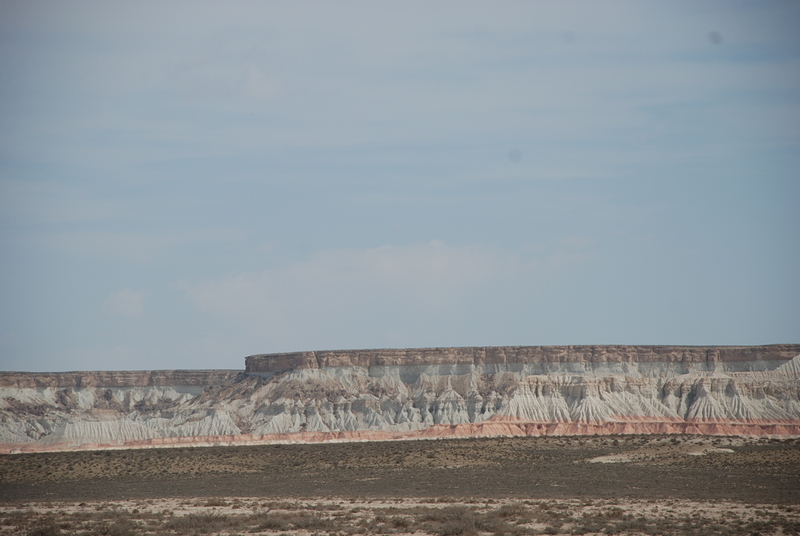 Arrive and discover Yangy Kala canyons. Return to Turkmenbashy. Flight to Ashgabat. Arrive. Drive to Darvaza. Visit Yerbent village along the route. Return on road and drive back to Ashgabat. Visit Tolkuchka bazaar before Ashgabat. Pls. kindly note that visa consular fee (cost depends on place to obtain), tax at border (12 USD p/p, paid once at entrance), daily travel tax 2 USD per day at hotels, photo/video fees, meals, gratuities, personal items, any other services missing above – NOT included into quotes. Thank you.